This kit is compatible with all Mitsubish Lancer Evolution X vehicles. It is used to upgrade the fuel feed line on the Evo X. The factory fuel feed line is 5/16” (8mm) inside diameter, which can become a restriction when using high flowing aftermarket fuel pumps. 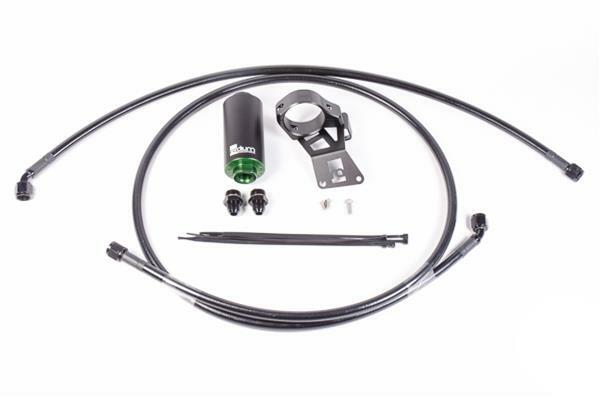 The Radium fuel feed line kit uses prefabricated -8AN PTFE fuel lines (1/2” inside diameter) with machine-crimped hose ends and a Radium high-flow fuel filter. The hose lengths are designed to reach from the fuel pump hanger area (underneath the rear seat) up to the fuel rail. The filter mounts under the car by the steering rack using a specially designed bracket that uses preexisting holes, so no drilling is required. This kit replaces the awkward OEM fuel feed tube going from the hard line on the firewall to the engine. The hose material is PTFE with machine-crimped hose ends and is ideal for use with all fuel types. The kit uses Radium’s unique and effective SAE Quick Connect adapters, which can be seen in detail HERE. This hose kit is also ideal for vehicles fitted with the Radium Engineering AOS kit, as shown below.